MOSCOW, November 19. /TASS/. US-born British financier William Browder, the founder of Hermitage Capital Management, will be placed on an international wanted list and his property will be confiscated under new criminal charges of setting up a criminal network, Adviser to Russia’s Prosecutor-General’s Office Nikolai Atmonyev said on Monday. "Browder will be put on an international wanted list with the aim of detaining and extraditing him," Atmonyev said, noting that his assets would be frozen, including those formally owned by his authorized representatives and the firms controlled by him. "A whole network of companies and credit institutions has been uncovered in Cyprus, Latvia and Switzerland, which were used to funnel money and cash large sums valued at amounts ranging from tens to hundreds of millions of dollars," he noted. Browder has been twice sentenced in Russia in absentia. On July 11, 2013, Moscow’s Tverskoy District Court found Browder guilty in absentia of massive tax evasion (estimated at 522 mln rubles, or $8 mln) and sentenced him to nine years in prison. He was also stripped of his right to do business for two years. In July 2014, Russia put Browder on a worldwide wanted list. 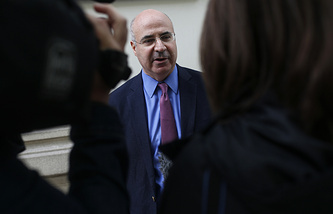 The Russian Prosecutor-General’s Office has repeatedly requested Interpol to arrest Browder. The latest news on such a request came in December 2017. On December 29, 2018 Moscow’s Tverskoy Court sentenced Browder in absentia to nine years in prison, finding him guilty of tax evasion to the tune of more than 3 billion rubles ($45.5 mln) and bankruptcy fraud. Ivan Cherkasov, Browder’s business partner, was given a similar sentence. The court ruled to satisfy a civil suit against the defendants and ordered them to pay 4.2 billion rubles ($64 mln), while barring them from doing business in Russia for three years.